Masha Lakisova will perform on Show 345 with Quartet Bellezza, to be recorded in September 2017. She also performed on Show 295, recorded October 2014, at the age of 13, and also on Show 315, recorded in November 2015, as part of Piano Trio Royale. 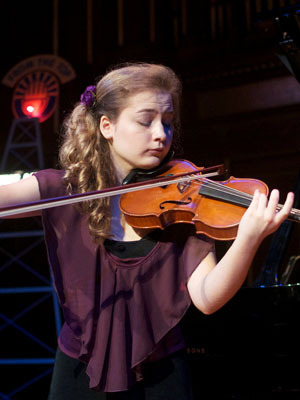 Masha Lakisova (violin), 13, from Vernon Hills, Illinois, began her musical journey on the piano at age 4. Shortly thereafter, Masha began taking violin lessons with Larisa Zhizhin and is presently a student of Drew Lecher and Grigory Kalinovsky. A recipient of From the Top’s Jack Kent Cooke Young Artist, Masha has performed in Carnegie Hall’s Weill Recital Hall in New York, the Chicago Cultural Center, Ravinia’s Bennett-Gordon Hall, and Northwestern University’s Pick-Staiger Hall. She was youngest finalist of the 7th International Louis Spohr Competition for Young Violinists in November of 2013. Masha is the concertmaster of the Midwest Young Artists Youth Symphony Orchestra and a member of the Piano Trio Royale. She loves spending time with her family and friends, listening to music, singing, discovering new artists, traveling, reading, and playing piano. Masha is a Jack Kent Cooke Young Artist.